Everyone loves feeding hummingbirds! It’s easy to do and they return the favor by returning repeatedly to your backyard. There are some specific safety issues you should keep in mind when feeding hummingbirds. Our readers have asked us about two specifically which are common potentially fatal mistakes many people make. And, if you aren’t already making your own hummingbird food, we make it really easy with a simple recipe. 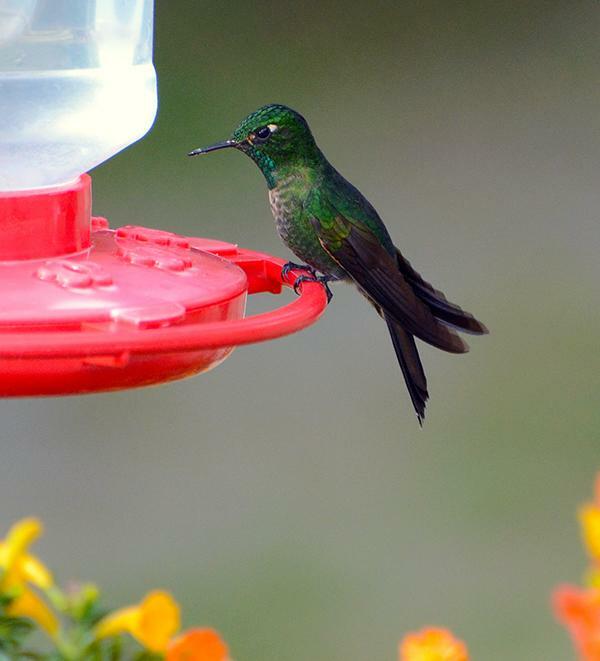 1 – Keep the food solution clean to avoid bacteria which may sicken or kill the hummingbirds. Bacteria spreads more quickly in hot weather so its important to keep all your feeders, but especially those for hummingbirds, really clean. Here is an article from The Spruce with detailed info on how to clean a hummingbird feeder perfectly. 2 – Never buy hummingbird food which is dyed red as it may fatally harm your birds. Most red-dyed pre-made hummingbird food is sugar water with red dye #40 which is made from coal and petro- chemicals. It is a known carcinogen and causes a variety of other really horrible side effects. If you want more information on these pre-made hummingbird foods, please read this article by Julie Zickefoose who is a well-known wildlife and bird rehabilitator, author and natural history artist. She has seen first hand in her patients the effects these products have on hummingbirds. When feeding your family, pets and backyard birds you sure want to make sure you know what’s in the food! Hummingbird solution is so simple to make and keep fresh that there is absolutely no reason to purchase pre-made food – and possibly endanger the birds you are feeding. if you make it yourself, you know the exact ingredients. And isn’t that the safest way to provide food for your backyard birds? Any leftover should be stored in the refrigerator and make sure its room temperature again before feeding your hummingbirds!